Acclaimed for his musicianship as an organist and conductor as well as for his academic pursuits in the field of Sacred Music, Russell Weismann is an emerging young artist who strives to engage audiences with a contemporary style of performance programming and is committed to inspiring younger musicians to engage and expand the role of the pipe organ in the context of both sacred and concert events. A native of Pittsburgh, Russell completed a Master of Music degree from Yale University and a Bachelor of Music degree from Duquesne University in addition to completing postgraduate coursework at Carnegie-Mellon University and earning a certificate of scholarship from the Yale Institute of Sacred Music. Russell is currently pursuing doctoral studies at George Mason University. His primary organ instructors were Martin Jean and John Walker. In addition to organ, Russell has studied harpsichord with Richard Rephann, choral conducting with Brady Allred and Jeffrey Douma, improvisation with Jeffrey Brillhart, and is an active carillonneur. As an organist, Russell has twice been accepted to participate in the London Organ Summer Course and has offered recitals across the United States as well as in Europe, Mexico, and Africa. He was a featured performer at the 2004 American Guild of Organists Convention in Los Angeles (Awarded First Place in the 2004 RCYO Competition), the 2010 Organ Historical Society Convention in Pittsburgh, the 2013 Conference of the National Association of Pastoral Musicians in Washington, DC., and the 2014 American Guild of Organists Convention in Boston, MA (as a finalist in the Schoenstein Organ Competition). 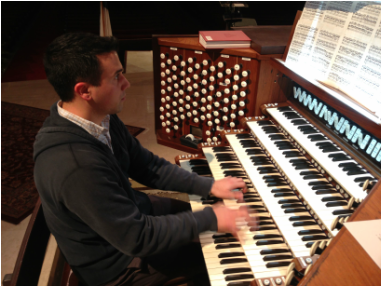 Russell has been featured on American Public Media’s Pipedreams, and was among a select few number of organists chosen to play a recital on the Rubenstein organ at the Kennedy Center for the Performing Arts during its inaugural year. An active member of the American Guild of Organists, Russell has served on the Guild’s national board for membership development and chapter support and as Past-Dean of the District of Columbia Chapter. He currently serves Artistic Director of "Music @ the Monastery", the popular DC AGO Members' Recital Series. He has successfully achieved the Guild’s Associate, Colleague, and Service Playing certificates. Aside from playing the organ, Russell has recently established himself as a composer. His works are published by G.I.A. publications. Russell is currently the Director of Music at St. Jane Frances de Chantal Parish in Bethesda, Maryland and Adjunct Professor of Music at George Mason University. His previous professional experience includes serving as Associate Director of Music at the Basilica of the National Shrine of the Immaculate Conception, Director of Music and Liturgy and Adjunct Professor of Sacred Music at Georgetown University, University Chapel Organist and Teaching Fellow at Yale University and Associate Music Director at Saint Paul Cathedral in Pittsburgh, PA.
As Past-Dean of the DC AGO Chapter, Russell strives to create an inclusive environment of hospitality, impartiality, and collegiality among members. Russell strongly believes that the AGO's best attribute is its members and thus welcomes everyone - organists, choral directors, choir members, academics, clergy, music lovers, etc... - to join the DC AGO. Together, we can all enhance the image of the "King of Instruments" in our Nation's Capital.